This monumental late Elizabethan portrait has great significance as the earlier known example of a life-size, full-length marriage portrait in English easel painting. 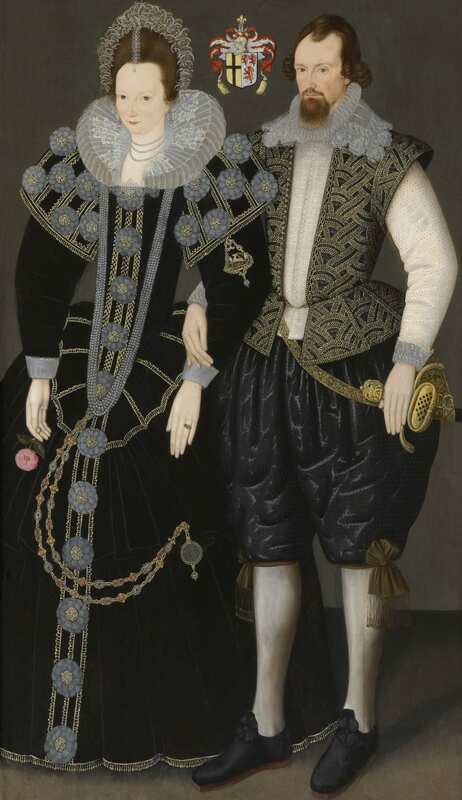 It was painted to celebrate the marriage of Sir Reginald Mohun to his third wife, Dorothy, daughter of John Chudleigh (1564 – 1589), Lady Mohun, who is shown holding a pink rose in her right hand, a symbol of betrothal. The portrait is unique not only in its size and subject, but in the manner in which the couple are portrayed, with arms entwined, giving the painting its endearing character. It is one of the earliest instances of affection and tender feeling between husband and wife in English portraiture, and arguably, the formation of their arms can be seen as a clever visual conceit, to form an ‘M’ for Mohun. Christie’s, New York, 4 June 2014, lot 24. Devon, Minehead, Dunster Castle, 1982 - 2004, while on loan to the National Trust. J. Cornforth, ‘Adare Manor, Co. Limerick – The Seat of the Earls of Dunraven’ Country Life 15 May 1969, p.1232, fig. 6. J. Ashelford, ‘Dress in the Age of Elizabeth I’, 1988, pp.72-3. The Weiss Gallery, ‘a fashionable likeness; early portraiture 1550-1710’, no. 3. Lady Mohun wears an extraordinary pendant jewel on her left sleeve, with a golden enameled ‘hart’ (stag) at its centre – the hart being a literal word-play on ‘heart’, and a symbol of their love for each other. Stags were often featured in Renaissance jewellery, paintings and literature as an allegory of love’s power to subdue even the wild and strong. Here, Lady Mohun is consciously wearing her ‘h[e]art on her sleeve’. We are grateful to Edward Town of the Yale Center for British Art for the attribution to the Unknown Follower of Custodis, an artist first identified in 1969 by Sir Roy Strong on the basis of the recurring use of an identical form of inscription, as well as obvious stylistic characteristics. The artist seems likely to have been an assistant of Custodis and perhaps even inherited his master’s pattern book. Though his work lacks the subtlety of Custodis himself, it has its own delicacy, as evidenced here by the extremely fine and detailed portrayal of the sitter’s costumes and delicate features. The small attributable corpus of the Unknown Follower was assembled by Strong and published in his seminal work The English Icon in 1969. This group of some eleven portraits includes a pair of pendant portraits depicting Nicholas Wadham and his wife Dorothy Petre, the founders of Wadham Colege, Oxford. The paintings all share a strikingly two-dimensional format. Our portrait has a notable provenance, virtually unbroken to the present day, dating back to the sitter’s family. Mohun’s daughter, Elizabeth (b. 1593), by his second wife Philippa, married the scion of another notable West Country family, Sir John Trelawny of Trelawny, and Sheriff of Cornwall. The painting passed through their descendants until it was acquired sometime in the early eighteenth century by the eminent Cornish historian Charles Sandoe Gilbert (1760 – 1831). It was almost certainly included in a sale of Gilbert’s possessions following his bankruptcy in 1825 when it was purchased by one of the most famous and discerning collectors of the nineteenth century, John Rushout, 2nd Baron Northwick (1769 – 1859) of Northwick Park. After Lord Northwick’s sale in 1838, it passed, via a dealer called Rodd, into the collection of the Earls of Durnraven within whose family it has remained until the present day. Sir Reginald (also know as Raynold) Mohun, was an important West Country magnate, who owned large estates in Cornwall at Boconnoc and Hall. He enjoyed a long, if sporadic, parliamentary career, and was elected to the Commons at various times between 1584 and 1625, where he represented seats under family control such as East Looe and Fowey. In 1599 he was knighted by Elizabeth I, and later became one of the first baronets created by James I in 1611. Mohun was evidently a man of great wealth, as represented by his baronetcy – titles were invented by James I as a brazen means of raising money, with prices beginning at £10,000. Indeed, the prime reason for Mohun’s appointment to the important post of Deputy Lieutenant of Cornwall, was because ‘he doth dwell in a convenient place… and is a gentleman of good sufficiency and credit to supply that place’. We are grateful to Geoffrey Munn for pointing out a Flemish pendant hart brooch from the collection of the Elector Palatine in the Museo degli Argenti, Florence, by way of comparison. Gilbert published in two volumes the Historical Survey of the County of Cornwall between 1817-20.